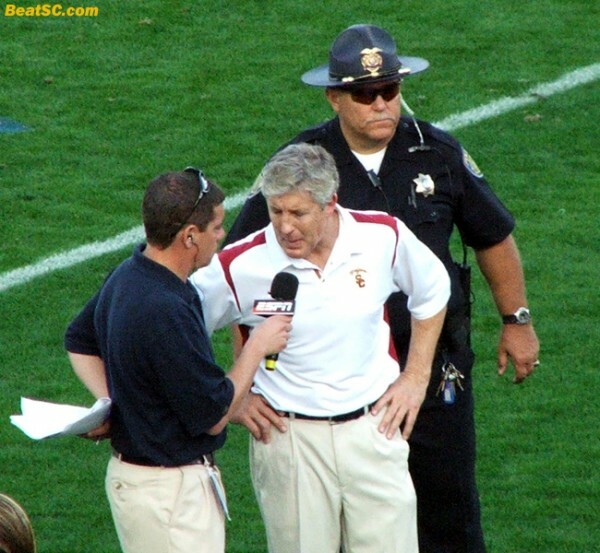 A lot of people hate smarmy and arrogant Pete Carroll, but not all of them are Bruins — Some trojans hate the ex-trojan Coach, too. Some trojan fans are open-minded enough to realize that Carroll was a cheat and a liar, who knew all about Reggie Bush’s illegal antics. They also realize that Carroll fostered an environment which encouraged law-breaking, steroid abuse, and rule violations. Furthermore, they realize that Carroll, not Bush, is responsible for the sanctions that usc is currently enduring, and that it was Carroll’s lack of institutional control that got the trojans busted. And finally, they even realize that Carroll bailed on usc right before the hammer fell, escaping the sanctions and fleeing to the NFL without sharing in any of the punishment. But none of that has anything to do with why LenDale White told Carroll “F*ck You.” Coming out of a Hollywood Nightclub the other night, appearing a bit intoxicated, White was cornered by a TMZ camera crew, and lured into an impromptu interview. White may have been wasted, but he was well aware that he was on camera, when he was — for some stupid reason — asked about the NBA. He said that if they are not Kobe or Chauncey Billups, “F*ck ’em.” Then he moved to the NFL and said if they’re not the Denver Broncos or Chris Johnson, “F*ck ’em.” And then he added more to his short list of who isn’t deserving of a “F*ck ’em” — Dominique Byrd, and all the other trojans, EXCEPT Pete Carroll… “F*ck you.” When asked about White’s feelings about usc, he said that he still has “trojan love,” just not for Carroll, sending one last “F*ck You” Carroll’s way. White failed to elaborate on why he hates Carroll so much, but if you have been following White’s star-crossed Pro career, you’d already know why.White’s NFL journey started at the 2006 pre-draft workouts, where he showed up fat and out of shape, earning the nickname “LenWhale White.” When he took off his jersey, one observer claimed that White needed a bra. Then White was accused of being lazy, for not participating in all the workouts. Then, despite all the risks, ex-trojan Jeff Fisher drafted White onto the Tennessee Titans, where White promptly got into a fight with a teammate, and SPAT in the teammate’s face. Two years later, he was cited by Police for destruction of property and disobeying officers of the law. The next year, he showed more trojan class by demonstratively stomping on a Pittsburgh Steeler “Terrible Towel.” Then the following year, Chris Johnson exploded, making White obsolete in Tennessee. So the Titans traded White to the Seattle Seahawks, and their new Coach Pete Carroll. But shortly after arriving in Seattle, there was a rumor that White had failed a drug test, and was going to be suspended for 4 games, so Carroll DUMPED White, only a month after signing him… and THAT is where the “F*ck You” came from. So even though Carroll had “F*ck You’s” coming for a thousand different reasons, THE ONE THAT HE GOT probably wasn’t deserved, considering that the rumor turned out to be 100% accurate. What Coach would want to waste a roster spot on a drug addict who has to ride the pine for the first four games of the season? How could White not understand that? It’s just the nature of the business. But leave it to a trojan to over-react like a baby over an intelligent business decision. On the other hand, maybe he’s mad about the WAY Carroll axed him. MAYBE Caroll told him not to worry, and that he’s got his back, and then an hour later White found out from ESPN that he was toast. I certainly wouldn’t put something like that past the unethical and cowardly Carroll. SO, maybe the F. U. was indeed deserved. And of course, even if it wasn’t warranted for THAT, there are many other people who have plenty of justification to have said the same thing… They just have enough class and sense to not blurt it out drunkenly to a video crew. It will be interesting to see what transpires if White’s current team, the Denver Broncos, gets to play Carroll’s Seahawks in 2011 — I think I know whom Carroll’s defensive scheme will be sure to stop in his tracks. And speaking of the NFL, right now, on the front page of NFL.com, is a photo of Bruin Linebacker Akeem Ayers, topping an article about versatile Defensive players who headline the upcoming Draft. Nice to see a UCLA uniform on the home page of NFL.com — Hopefully, Ayers will represent UCLA with Class, unlike LenWhale… and hopefully, Akeem will not get drafted by Seattle. "LENDALE’S JUST SAYIN’ WHAT EVERYONE’S THINKING" was published on February 22nd, 2011 and is listed in News from the Dark Side.